When I first re-started this web site, I did so in support of my book that had been published, “A Charter of Negative Liberties, Defining the Bill of Rights and Other Commentary.” My goal was to discuss daily news events through the prism of our Constitution. It’s still my goal, but environmental issues have been dominating my time recently and I just can’t ignore the Green SS. You see, the top leadership of the environmental movement was hijacked by the left, the liberals, the socialists and the communists right after the Berlin wall fell. All the communists in Germany moved to the Green Party. So when I discuss the Green SS, I am still defending our Constitution. Make sense? Am I a right wing radical? In another article I posted under “Editor’s Messages” I called myself a Constitutionalist, and I am. But what does that mean? For me it’s simple. I believe in the word and intent of the United States Constitution. I believe the States entered into a contract in order to form a federal government that the States agreed to form. The contract was and still is the Constitution and that document established a federal government with very limited authority and very limited powers. However, when the Constitution was agreed to, the States started to worry that the Constitution didn’t spell out the limits the new federal government would have. With that concern, they added ten amendments that we all know as The Bill of a Rights. In the Constitution they didn’t say ONE word about what the People must do, what the People must obey, how the People will act, they said nothing requiring a citizen of the United States to do anything. They intended the People be free and enjoy their freedom, so instead when they wrote the Constitution they placed limits on the authority and power of the federal government. During the 1800’s, as the United States was growing at a rate unheard of in history, it was doing so without any federal intervention. We were free enough to settle arguments out on the street. Imagine that, the centuries old art of dueling was still a free act. Can you imagine back when new towns were sprouting up needing a building permit or a business license? Nope, they were free. You really have to think about the fact that there is nothing in the Constitution that holds the American citizens to do anything and I mean nothing. That’s not what the Constitution is about. It restricts the limits of the federal government’s authority and that truly DEFINES FREEDOM! One thing though, if you were to read the original Constitution you would probably fall asleep. It’s not meant to be read, as such, it’s meant to be referred to and followed. So how can you follow it without reading it? No, I’m not Nancy Pelosi, you must read it to understand it. But the first time you read it, you will be bored to tears. Why? Because the Constitution of the United States is a form of business plan, adopted as law and how we run our country. In this “business plan” it has an Organizational Structure, some Policies and procedures and issues some very limited powers and authority to the president and to the Congress. 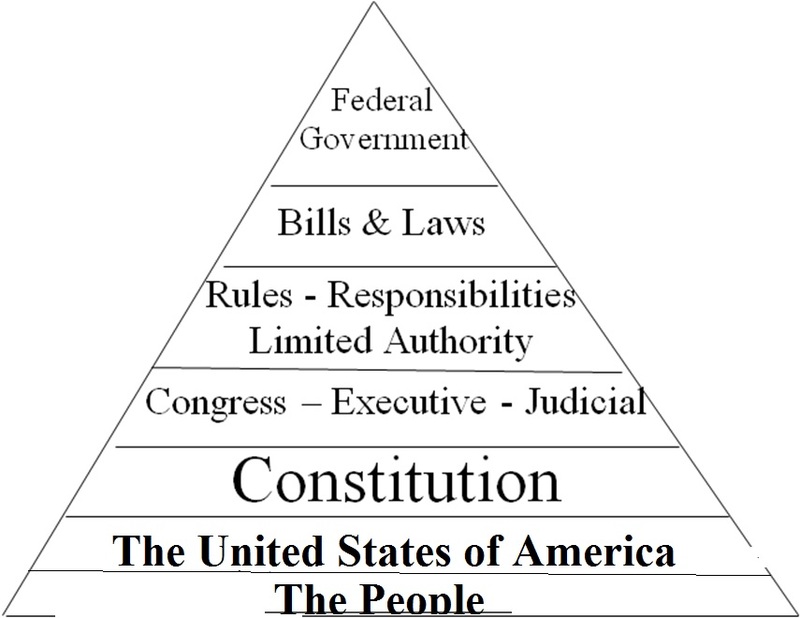 It’s pretty hard to make an organizational structure a good read, but every country in the world, every State and every city must have a Constitution or a Charter. Every business must have an equivalent called an Operating Agreement. Reading the Constitution only starts to get interesting when you start reading the Bill of Rights. Especially, when you read the Preamble to the Bill of Rights. First you have to be lucky enough to have a copy of the Bill of Rights that contains the Preamble. I’ve been surprised at how many people I meet who didn’t know there was a Preamble, but it’s not their fault, some publisher’s who are printing the little Constitution books you see around don’t include the Preamble. Actually, in the original parchment copy of the Bill of Rights, the preamble is the first sentence and in that one sentence they gave us the key to understanding the Constitution. They told us why they wrote the Bill of Rights and what their mindset must have been prior to writing the Bill of Rights as they wrote the Constitution. Once you understand this one sentence, you will understand our Constitution. Why did the States want “further declaratory and restrictive clauses to be added? Because even though the framers thought they had written a Constitution that would not allow any future president to assume any authority or power not included in the Constitution, they hadn’t said so. So with that information, we know the mindset of the framers when they wrote the original Constitution. They had intended that unless a power or a authority was written in the Constitution, the federal government could not ever assume that power or authority. Ergo, the Bill of Rights. I won’t go through all the Amendments as I did in my book, but you might want to read my definitions. I will jump to the Tenth Amendment. I mention the Tenth Amendment, because it is in this amendment that they finally do say what they failed to say in the original Constitution. It’s clear as a bell and should need no interpretation. If any authority or power is not specifically granted (to the federal government), in the Constitution, the federal government doesn’t have it. PERIOD! Can a Democrat be a Constitutionalists? I don’t believe I am an ideologue or a right wing radical, I’m an American who believes in the Constitution and this nation is going to have to decide if this country is going to remain a Constitutional Republic as intended because we are not abiding by the Constitution today. We the People are allowing the federal government to assume authority and power it was never intended to have. Does any American president have the Constitutional authority to have a vision to take the United States of America any direction other than what is called for in the Constitution? The president swears to uphold, defend and support the Constitution and the Constitution is the only legal direction the United States can advance. No one man or woman can bring forth a new direction or have a new vision for the United States without amending the Constitution. If a president and or Congress of the United States attempts to usurp the Constitution then that president and or Congress has broken the contract with the States and the States can legally form a new government. Alternatively the States can amend the Constitution at any time as long as three fourths of the States decide to do so. Our founding fathers were intent on not allowing the federal government and especially the executive branch to interfere with the amendment process so the executive branch is not included in the amendment process. Even the man who started the progressive movement in America, Woodrow Wilson, worked within the boundaries of the Constitution through the Amendment process by convincing the State Legislatures to ratify the amendments he supported. I believe his policies were bad for America, but that’s water under the bridge. I believe Roosevelt’s policies were bad for America, but that’s also water under the bridge. What is happening today is not yet water under the bridge and we can still stop this administration in its attempt to socialize this country. The only way to stop this unconstitutional law, that is a new tax and distribution disguised as The Affordable Health Care Act, is for the States to exert their authority by the amendment process. We can stop socialized medicine from ruining the best health care system in the history of mankind by amendment. The framers of this great nation gave the final authority, in all matters, to the States and the People via the Amendment process. We need to use that process now to finally put an end to ObamaCare. Wake up, wake your children up, wake your neighbors up, wake up strangers, wake up friends, wake up enemies, but wake up, we’re about to lose it all. Wake up and contact your State Senators and Representatives and start the wheels of freedom in motion. We can be Republican, Democrat or Independent, but we all must be Constitutionalists or we will fall into the dust bin of history as the generation who just pissed away their freedom. A freedom that mankind spent centuries trying to achieve. Our Founders gave the Power to the People, it’s time to use it. 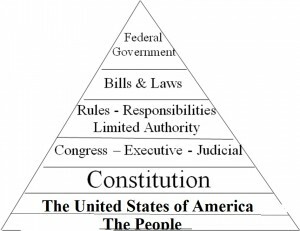 The above is how the Founding Fathers of this great nation envisioned the levels of authority. Each level receives its authority from the level below. Bottom line is that the People really do run this country and can amend the Constitution with a 3/4 approval of State Legislatures.